Thank you to my supporters on Patreon! As popular as the Age of Empires games have been, and as beloved as they continue to be, it’s been a source of occasional wonderment to me that we haven’t seen more games deriving significant inspiration from them. We’ve seen continued homages to the storied RTS Total Annihilation in Supreme Commander and Planetary Annihilation and Zero-K; Petroglyph has made much of their relationship with the classic Command and Conquer franchise as selling points for Grey Goo, 8 Bit Armies, and Forged Battalion, and of course over the years Blizzard’s Warcraft and StarCraft formulas have come to be seen as the baseline against which RTS has been measured. But for Age of Empires, I feel like we’ve seen relatively little in the way of spin-offs and little in the way of support for this type of game in terms of new thinking… Until recently, that is. Age of Empires IV is on the horizon, and we’re getting remasters of virtually every other Age title except for the ill-fated Age Online, which I believe is itself getting a fan remake. 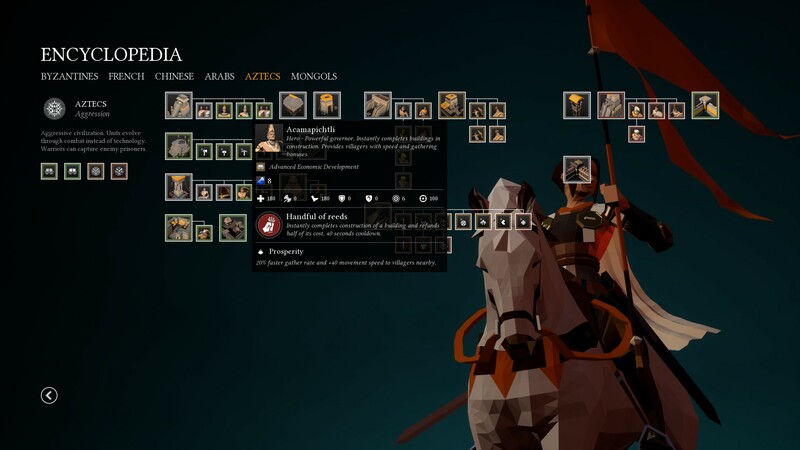 But, years before the glut of releases and announcements regarding the pseudo-resurrection of ‘core’ Age of Empires, Italian indie studio DESTINYBit was quietly working away on their inaugural title, Empires Apart. Not a polishing of 1997’s groundbreaking historical RTS, but… an homage. A unique take. We’re going to examine the art style, gameplay (including its similarities and differences to the source material), and overall game content. let’s get cracking. A brief note on this article: I am most familiar with Age of Empires, Age of Empires 2, and Age of Empires Online. This article is written from that perspective and may not account for mechanical systems in Age of Empires 3 nor Age of Mythology. I wanted to be up-front about this in the case it impacts your perception of my analysis of this game. Much of the core gameplay is strongly recognizable to someone who’s played an Age of Empires-style game before. Houses support 5 population, there are dropoff buildings that you want to build as close to resource deposits as possible, you’re harvesting Food (in the form of sheep, boars, deer, fish, farms, and berries all recognizable from the Age of Empires games), Gold, Wood, and Stone. Stone is a ‘defensive’ resource, mostly, only being used a little in high tech structures. And workers. You have to produce so many workers. Tons of them. Metric tons of wood choppers, and farmers and gold miners. So many delicious little targets for cavalry run-bys. You have tech broadly grouped into ‘ages’ – though there are some significant differences in Empires Apart to their source material, which we’ll get to in a bit. Units are grouped into traditional melee infantry, anti-cavalry spearmen, anti-ranged skirmisher units, cavalry, cavalry archers, siege weapons… Most of it’s pretty much the sort of thing you’d see in Age of Empires 1 or 2. Though most units have some kind of twist that feels inspired by more modern game design philosophies. For instance, many Byzantine units apply a ‘Disrupt’ debuff to enemies when attacking that allows their cavalry to deal bonus damage. 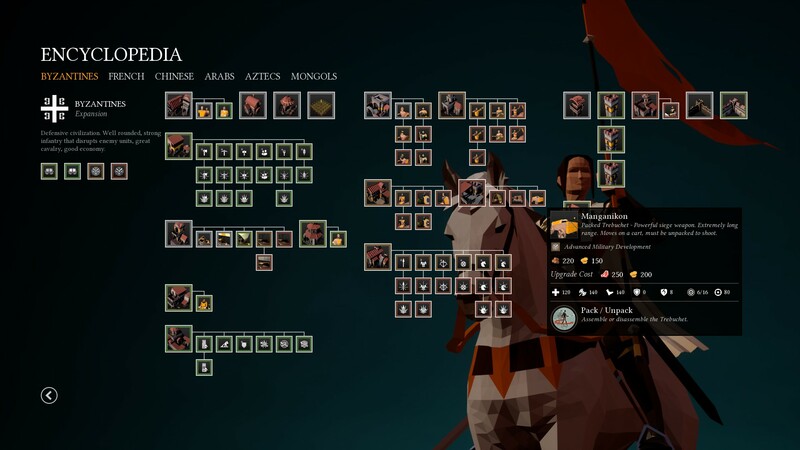 Aztec units gain experience when attacking, and improve for each enemy they kill. Mongol units gain ‘bloodlust’ while they fight. The Chinese have a sniper. Aztecs and Arabs have invisible assassin units (assassins un-stealth when they attack, becoming vulnerable. The Aztec assassin can’t re-stealth until the next nightfall). And of course there are priests. The Aztecs only have infantry units. Also, yes, they’re fighting the Chinese in this screenshot. Oh goodness, the priests. The Arabs have the Imam, a traditional take on the Age of Empires priest unit: it converts enemies. But every other priest is different. Aztec priests curse enemy units. Mongol mounted priests buff allies with the ability to dodge incoming attacks. There’s an economic-oriented priest that buffs workers. While I haven’t played Age of Empires 3 or Age of Mythology, so maybe I missed these little touches coming to a core Age game, the above-mentioned ideas and mechanics feel pretty darn unique and compelling to me. 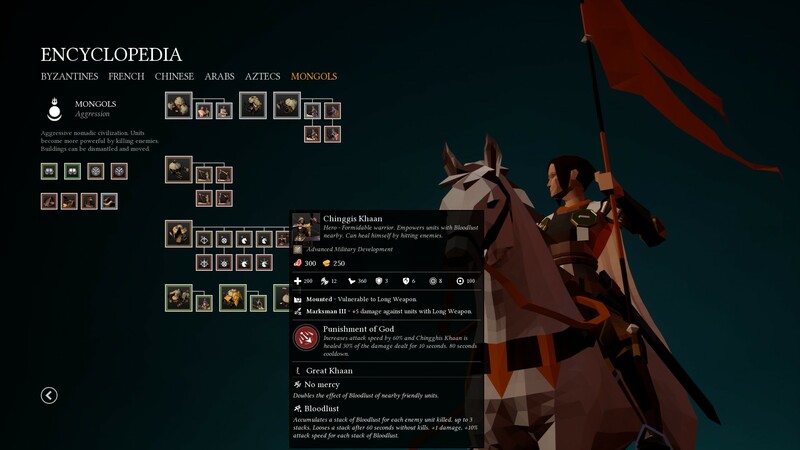 The differences between each civilization feel considered and meaningful, and the design of the less traditional factions (Aztecs and Mongols, which again happen to be my favorites at the moment) seems daring to me. Daring, in that Aztecs only have infantry units. They don’t have high-powered, heavy hitting cavalry, don’t have trebuchets or catapults or Rams for knocking down walls. They don’t, if I recall correctly, have heavy towers themselves (though their fortress feels pretty formidable). The Mongols almost feel like you’re playing a different game entirely. They have very little research, they use a unit to transform/unpack into structures (many structures require 3 or 4 of these units to combine together), they have no navy to speak of, cannot farm, cannot build walls, have no houses, and have no defensive structures whatsoever. I could write a lot about the Mongols (maybe I will in future, it’s a really interesting faction in a game that typically features very a different mindset and methodology). It excites me as a designer and as a player to have these radically different approaches to playing a competitive RTS game, that kind of turn my expectations of Age of Empires on their side and force me to think about gameplay elements from an unfamiliar perspective. It’s a bold move, to borrow and mangle the phrase, and I really hope it pays off. They’ve certainly got my attention, especially with the Mongols civilization. As with any stylized art direction, Empires Apart’s graphics have proven to be a little controversial. DESTINYbit chose to go with a colorful, low-poly design that seemingly turned off some vocal people on various social media sites. But I have to say, it really works for me for the most part. Terrain textures are by and large really well done, and there’s this almost painterly quality to fog of war, wind rustling grass, and many of the smaller ‘organic’ elements that’s really beautiful. The terrain geometry really lends itself to the art style, bringing to mind the similar design from Age of Empires 1 and 2. Structures, themselves often comprised of a handful of geometric shapes, are really well done: they’re slightly cartoony, enough to stand out with vibrant colors and memorable, rather dynamic shapes, large enough to be substantial, and invested with enough detail to make them feel interesting. The Mongols, who I feel a little bad for continuing to harp on, have wonderful dome-shaped tents for buildings. Aztec structures have some dynamic angles to them that I really enjoy. Occasionally, especially since there are so many buildings for most factions, I found myself confusing which structure is which, but I think this is not uncommon for this type of game and should improve over time as familiarity with each structure increases. It mostly happens with later-game support/research oriented structures. Large cities really sell the game’s low-poly approach, to me. And really, the buildings are what count. Unit models are small enough that I really can’t tell they’re low-poly. They are, sometimes, hard to tell apart. Using the Mongols (again) as an example: they have 2 melee cavalry units, and 2 archer cavalry. At a glance, I have a very hard time telling them apart. This isn’t a huge deal in a game where you’re dealing with, typically, masses of units attacking at a time, but can be frustrating when you’re striving for precision, or to determine the exact force composition you’re going to be dealing with in a battle. Again, I’m not sure this is unique to Empires Apart, it’s something that can be frustratingly common in RTS in general, especially larger-scale games where tons of units are on screen at once. But, I think it’s worth mentioning, since it’s caused problems in-match from time to time. I am a big fan of how the Mongols’ larger structures look. Also, their build system is challenging to get the hang of, but incredibly compelling. Also, this is one of the cleanest, clearest, most efficient RTS UIs I’ve had the pleasure to interact with. The only place that the game’s low-poly style has really bothered me is with the trees. Some, like the ones pictures in the above screenshot, are almost obnoxious in the profusion of their sharply-angled bulbousness (not a sentence I ever anticipated writing). Pine trees on winter maps are much less obtrusive, and its only 1 or 2 of the tilesets where I was bothered at all with how the trees looked. I supposed this is a good time to talk about map design. 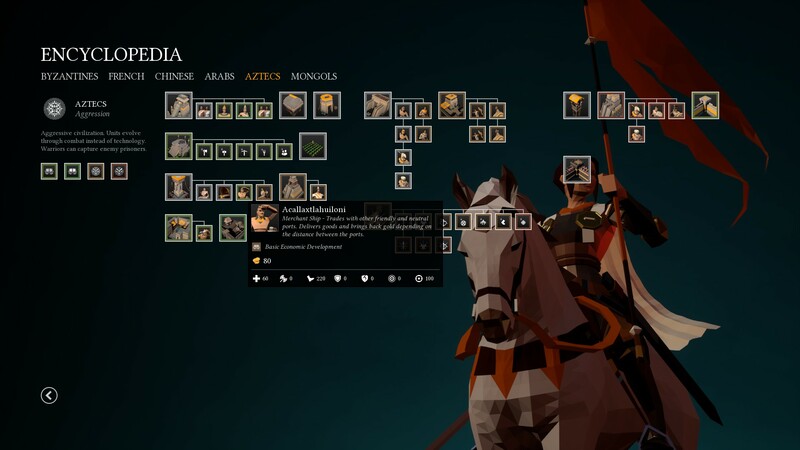 Like Age of Empires, maps in Empires Apart are procedurally generated, with differences based on the biome you pick, or which is randomly determined when the match is created. Resource distribution seems to vary somewhat based on biome: some seem to have more sheep, more deer/gazelles, et cetera. Some surround many resource deposits partially by a semicircular screen of trees. The “Mare Nostrum” tileset features a large central body of water, and there’s an Island tileset that, well, has islands. Most other tilesets feature little or no water. Water does not seem to be a core aspect of Empires Apart’s design, and for that I’m thankful. I’m somewhat skeptical of the utility of naval units in RTS, though as always please take my personal preferences with a grain of salt. Beachfront property! Another reason it’s good that few maps have water is that unit pathfinding tends to not handle water well. I’ve had plenty of units get “stuck” trying to navigate around lakes and such. – the 1.1.4 patch, released on 4/5/2018, claims to offer major pathfinding improvements, however. The game’s user interface is very well done. It’s unobtrusive and clear to the highest degree. There’s no civilization-related “chrome” or UI theming as you see in StarCraft and many other RTS, and while you might arguably lose out a smidge on ‘flavor’ the amount of visible screen real-estate is a breath of fresh air. Of note are the elements in the top middle of the UI: one for advancing your ‘economic tech’ level, one for advancing ‘military tech’ and indicators for chosen hero unit, number of Relics owned, and number of Town Centers. There’s also an idle villagers button, trade UI, and toggle for auto-seeding farms. My main complaints are the lack of always-visible indicators for the hotkeys for all of this. You learn pretty quickly that QWERTYASDF etc handle all unit control and building production commands (with R being the common ability hotkey for units with active or toggle abilities) but I’m still not sure if I can use a hotkey to activate my Age Up buttons, or to select idle villagers. It’s maybe a minor quibble, and one that could be remedied by a deeper perusal of hotkey bindings, but really the decreased cognitive burned of visible hotkey reminders would be pretty major in terms of usability. The game menus are gorgeously understated. There is room for debate over the game’s art style: I like it, and I feel like I laid out why pretty well above, but have heard a fair share of reasonable detractors on various social media. I’m not sure, however, how much room for debate there is over the game’s content. Empires Apart is billed as “multiplayer focused” and this is pretty clearly marketing spin on the fact that it’s launched with very sparse single player content. Aside from a tutorial, there is the standard AI skirmish mode, a selection of civilization-specific challenges, and a survival mode. There is no campaign. Now, I’ll be really up front with this: single player content is really not usually my bag. I typically choose to play things like what they’ve included: skill-based, bite-sized chunks of non-multiplayer content. I will usually do some of a campaign, but transition pretty firmly to multiplayer once I feel I have a decent grasp of the basics. But my personal preference is not the bar here. I kind of want to be wrong in this assessment, but the lack of any sort of longer-form, repeatable, interconnected single player content (e.g. some sort of campaign) feels like a big weakness in the game. That said, I have found the challenges to be actually challenging. They’re typically limited scenarios with a handful of units, asking you to do things like kill a spearman with a cavalry archer on a tiny map with limited manevuerability. It’s possible that my lack of skill is telling here and many would find them easier than I did, but I spent about 2 hours tackling various ones without mastering one, before moving back to skirmishes and Survival Mode. Survival is a good bit of fun. Matches in Empires Apart feature a day/night cycle, and in the Skirmish mode, waves of enemies attack at nighttime. You are only given one town hall in Skirmish, and you lose when it dies. The Skirmish map is predefined and pretty small, with very limited gold and stone. Enemies approach along pre-determined routes, and increase in frequency over time. I typically last about 45 minutes so far, and I’d imagine that those with beefier Age chops would be able to hold out significantly longer. A notice on the Survival menu screen indicates that more maps are coming in the future. There’s also an Extras page with an Encyclopedia, which really excited me. One of the big draws of the classic Age of Empires games was all of the historical information stored in-game for your perusal. Alas, that’s not what the Encyclopedia is, instead being an overview of each faction’s tech tree. Useful, but not necessarily juicy. I ran into a small but significant crop of issues when playing Empires Apart. First and foremost, while my computer is relatively low-end, I experienced occasional massive FPS drops with no apparent cause. DESTINYbit did release a patch on 4/5/2018, their 1.1.4 update, which included a fix for AMD CPUs, and hopefully this will address the FPS drops I experienced. I have not noticed any FPS drops since the patch, but as of the writing it’s been less than 24 hours since its release. 1.1.4 supposedly also addresses AI and pathfinding, both of which I’ve had intermittent issues with. I think I mentioned it above, but sometimes unit just get stuck when traveling. This mostly seems to happen around treelines, cliffs, or water, where units will not travel around them but get caught trying to run through these obstacles instead. You can mostly avoid this with shift-queuing movement commands or babysitting, but it feels pretty bad when you catch it happening. Hopefully the new patch has done a lot to mitigate this sort of thing. Again, this has been sporadic for me, not continual. Also, occasionally, the AI would kind of… break? I had one Survival match where the AI refused to attack anything but the town center, which made it considerably easier to deal with (in other matches they also targeted villagers, often various work areas at the same time, which was much more effective at disrupting my defenses). I also had a handful of matches where the AI player simply didn’t build a significant army, and one instance where it spent almost 15 minutes partially building and then cancelling structures, only to come back strongly when I started killing structures. Most of the matches I played, were not like this, and a combination of me shaking off the rust after so many years away from Age of Empires-style games and competent enemy AI made it more than a couple matches before I was able to properly defend against earlyish enemy aggression. I’m hopeful that 1.1.4 is the start of something really good, and Empires Apart’s AI and pathfinding continue to improve, especially since Skirmish mode is going to be a big piece of the core game experience until and unless they implement a campaign. Thus far I have had a really good time with Empires Apart. It’s comfortingly nostalgic, very well art directed, with some fun units and civilizations to experience. It’s new enough to feel unique while familiar enough to tickle my childhood Age of Empires memories. My main concern lies in the ‘mutliplayer focus.’ While this is my preference in RTS, I worry that a $30USD price tag is steep for a game with no campaign and still-developing mutliplayer community and stable of non-narrative single player content. I think it’s got the potential to be a hard sell to consumers. So, there’s fun to be had. There are compelling systems here. But there’s a barrier to entry in terms of the cost of the product (never a trivial decision when releasing a game, or when purchasing one) and some risk regarding the current size of the community. As a multiplayer-centric RTS, Empires is going to want a lot of players involved to maximize everyone’s fun. Thanks for reading. I hope this overview has helped somewhat as you research Empires Apart. And if you do pick it up, I hope to see you on the battlefield. It’s basically an indie clone of AoE:O. And yes, AoM/AoE3/AoE:O did pretty much exactly this years earlier. How could you have not played any of these games is beyond me. I fully expect such shallow analysis to go along with this level of rudeness. Age of Empires Online does bear some resemblance to Empires Apart, but even you should be able to acknowledge the differences between the games. Here’s some of the low-hanging fruit: priests, the Aztec and Mongol’s unique mechanics, the fact that Empires Apart has split ages, unit stealth and active abilities seen in Empires Apart. To say things like what I’ve listed above don’t have an important impact on the game would, frankly, be stupid. So let’s not indulge that. Likewise the idea of Rise of Nations as a simple ‘Age of Empires clone’ is INCREDIBLY reductive. But again, to come to this blog, casting aspersions because an author hasn’t played exactly the games you have, to hide under the blanket of anonymity, I’d expect such shallow analysis to come hand-in-hand with such rudneness. “There were tons of C&C clones until AoE came around” considering C&C only existed for two years before AoE came out and only two RTS came out with similar mechanics came out during that time I’m not sure you are qualified to give analysis here. Also there were very few RTS that featured heroes (and almost zero with upkeep) post-WC3. I gotta say, we always get hit with the “another AoE clone” comment and I’m always puzzled because I’m like “another? where are they?? I wanna play them!”. But now I realize that if even Empire Earth, which is an incredibly complex RTS which goes from the stone age all the way to the space/digital age, is considered (by you or I guess some other people as well) an AoE clone… there’s no hope for us. Why you rushed the release.? Without SP campaign… or an editor, nodding tools.